Two Bear Audio is a full service, turn-key audio tour company. Two Bear Audio will research, write and produce "Theatre of the Mind" audio tours and then provide the equipment, signage and marketing plan to help your compelling new interpretation attract new customers and generate new revenues. The Buffalo Bill Dam Visitor Center needed inspiring interpretation. A non-profit organization, the Visitor Center educates visitors about the value and historical significance of what was once the world's largest concrete dam. The dam was built from 1905-1910 and named after its most well known advocate, William F. "Buffalo Bill" Cody. The Visitor Center provides various displays and written interpretive information, but many visitors still left the National Monument without fully understanding the significant role it played in national and local history. The Visitor Center's Board of Directors agreed they needed a more inspiring and emotionally compelling way to share their story. But time was short. This was February and the Dam Visitor Center opened for the summer season on May 1. Mike and Margie Johnson of Two Bear Audio visualized that an expertly-produced, "Theatre of the Mind" audio tour could bring the dam story to life to the facility's 45,000 annual visitors without stretching Visitor Center resources or personnel. They envisioned using professional narrators, inspiring music and riveting sound effects. They presented their idea to the Visitor Center's Board of Directors and they caught the vision. They approved Two Bear Audio to provide a turn-key audio tour package -- write and produce the tour, provide 50 audio players, 50 laminated photo books, indoor and outdoor signage, and train the volunteers who run the Visitor Center. In exchange for the Johnson's talents and capital, the Visitor Center would enthusiastically recommend the tour to each visitor and split the $4 per-tour revenues with the Johnson's for the next five years. In effect, the 35-minute, $40,000 audio tour -- and its new revenue-generating abilities -- were provided to the Visitor Center free of charge. Better yet, Two Bear Audio presented the completed audio tour package to the dam on April 30, beating the dam's May 1 opening deadline. The Visitor Center bought out the Johnson's in April, 2006 and now own the audio tour exclusively. Thanks to Two Bear Audio, the dam now offers a compelling audio tour interpretation that generates new revenue while enhancing the guest experience. The Johnson's received Dam Board approval to start the project on Febuary 12, received final script approval on March 15 and the entire project (including production, tour CD's, audio players, customized lanyards, rechargable batteries, laminated photo books and installed signage) was completed and turned over to the dam on April 30 in time for their May 1 seasonal opening. When you hire Two Bear Audio, you get quality, passion AND speed. "Thanks Mike. You and Margie have gone the extra mile and we look forward to working with you on this great project." Buffalo Bill Dam Audio Tour, Sample 1 "An Amazing Engineering Marvel" © 2004 Two Bear Enterprises, Inc.
Buffalo Bill Dam Audio Tour, Sample 2 "The Dynamite Accident" © 2004 Two Bear Enterprises, Inc. 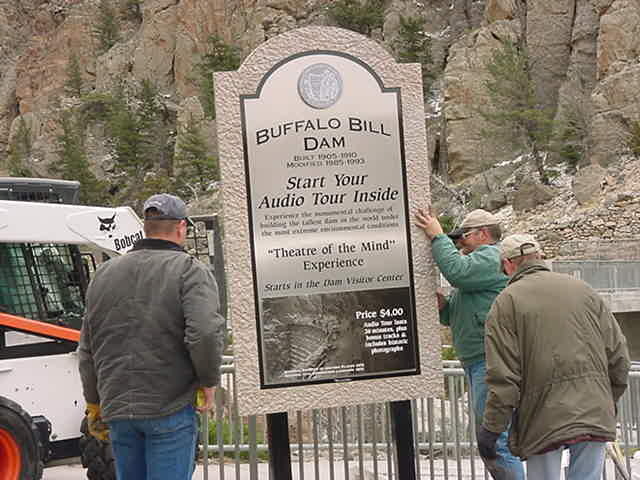 The Buffalo Bill Dam Audio Tour is a "Theatre of the Mind" experience that lasts 26 minutes and includes four bonus tracks which extend the tour to 35 minutes. Visitors who rent the tour are issued a portable, battery operated CD player loaded with the tour CD. The player hangs from a lanyard around the visitor's neck and each player comes with adjustable headphones to provide a surround-sound listening experience. Visitors are also loaned a laminated photo book that includes a map of tour markers, list of track numbers and their description, CD player operating instructions and historical photos to better understand the magnitude of the construction process. A tour CD can also be purchased for $8.95 and includes many of the historical photos provided with the rented tour. and conveys the dam's heritage as a National Monument. 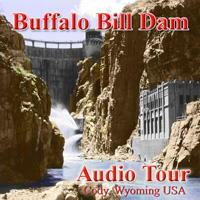 I can't imagine visiting the Buffalo Bill Dam WITHOUT taking the audio tour. It's incredible! The tour was great!. I'm now inclined to take audio tours at other attractions now that I understand how good they can be. I just got a call from Lovat Wilkins, D.W. Cole's (the dam's builder) granddaughter, who lives in Athens, Georgia. She said she cried when she listened to the CD. She is so pleased. You did a wonderful job and I'm so pleased to have been a small part of this great project. I expect to hear from the other Coles soon and know their reaction will be the same. I very much appreciated what you furnished me with regard to the tour and the photo book, and I'll be getting those back to you after I play them a few more times for guests! ... Thanks for sharing this. Let me tell you again what great additions you are to Cody! We tell everyone about the trolley tours. We're eager to take another one soon, and the audio tour for the Buffalo Bill Dam Visitor's Center is absolutely superb! DOES YOUR VENUE QUALIFY FOR A FREE, TURN-KEY AUDIO TOUR PROGRAM? Two Bear Audio is currently looking for other clients who could use an inspiring, "Theatre of the Mind" audio tour to enhance the interpretation of their facilities while generating new revenue. We offer the entire turn-key package -- research, writing, production, equipment, signage, marketing plan and employee training. With your high traffic and our sponsorship and revenue sharing plans, this service can be provided to your organization with no out-of-pocket expense. Or, if you have your own in-house staff and capital budget, Two Bear Audio can provide just the elements you need at a fixed price. Just call or email to start the dialogue that will provide you with a firm quote.